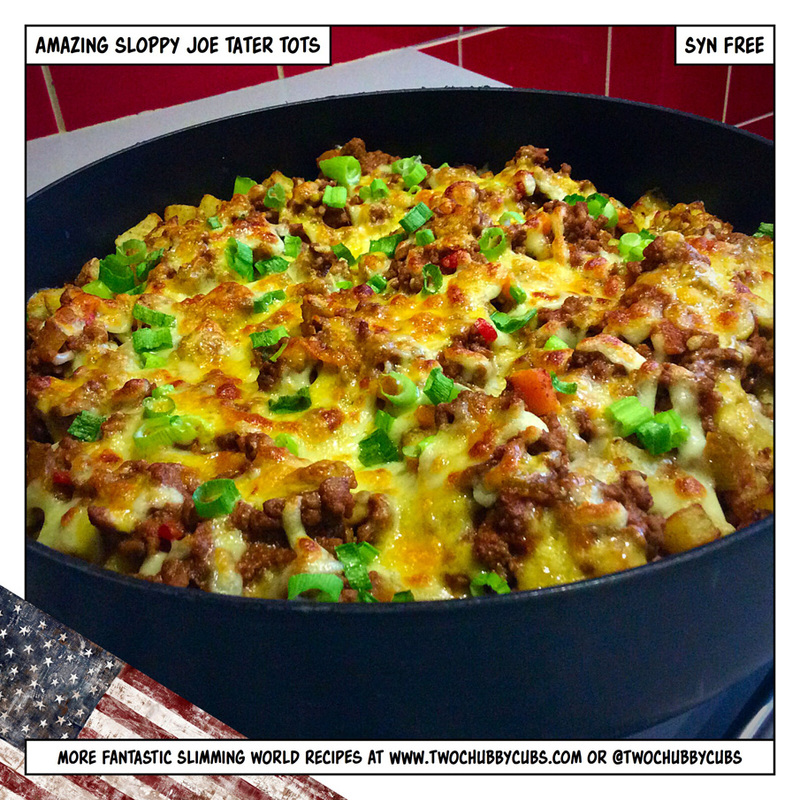 The recipe tonight is a mix-up of two American junk foods – the sloppy joe and tater tots. Tater tots are traditionally mashed potato shaped into little cylinders and deep-fried and they taste amazing, but Margaret would be choking on her Blue Nun if she thought I was deep-frying. So naturally we’ve made a few switches and tweaks and let me tell you, this is genuinely one of the best recipes we’ve done so far. Scroll down and enjoy! OH and it’s syn-free! Anyway, today’s American diary entry, from our book available here, is from the day we went to Wet and Wild, which isn’t some kind of golden-showers den of sin, but rather a scrappy but beloved waterpark at the arse-end of International Drive. I’ve since heard it’s shutting down, which is a shame, but given we probably left indelible skidmarks on some of the scarier rides it’s probably for the best. Finally – Wet ‘n’ Wild. The concrete and fag-end cuckolded sibling of the rather more salubrious Aquatica, held out of our reach for so long by either weather-based closures or burrito-based bum trouble. A prompt early morning call revealed the park to be open, so after fitting a good eight hundred pastries down our chops, we taxied over to have some splish-splash fun. Before entering, we paid our respects to the Metropolitan Express (the very first hotel we ever stayed in when visiting Orlando back in 2008) by nipping over the road and well, wandering past the reception and down into the corridors. A little bit about the Metropolitan Express before I come to the meat of the day. It’s grim. Proper grim. We chose the hotel because we were on a budget and didn’t know any better – those were the days when we went to Orlando for ten days, didn’t stay at Disney and had a budget of $1000 for the entire holiday, seems unreal now. The staff are well-meaning and very helpful, but security left a lot to be desired – and this clearly hadn’t improved by the fact that we just sauntered into the hotel past reception and helped ourselves to the free coffee laid out for hotel guests. Sorry, but you shouldn’t be able to do that considering it’s at the rougher end of International Drive. If anyone has the place booked, reconsider. Always pay what you can afford rather than trying to save a few pounds here and there. You may think that we were only able to get back into the hotel because we had made such a fabulous impression on the reception staff that they considered us old friends – but this can’t be the case. I’ll tell you why. On the last day of our first stay back in 2008, we decided to er…make whoopy (we were young then) before leaving. What we hadn’t realised was that I had stashed an open packet of Cheesits under the duvet of the ‘spare’ bed in the room, and we proceeded, entirely by accident, to squash the entire packet, and its radioactive orange contents, into the blankets, under the duvet and up the pillowcases. After we had er…finished, we realised our error, and left hastily, the orange stain refusing to shift from the sheets. Heaven knows what Monique thought when she came to clean the room, but considering we had strategically left a Pringle right in the middle of the carpet for four days to see whether housekeeping were doing their job and it remained there right until the last day, I don’t think the housekeeping was up to much anyway. Oh, and the place stank of cheap weed, too. Not that I know what expensive weed smells like, I hasten to add. I did think I had inhaled rather too much second-hand toke once I had seen the carpets in the hallway mind. It was like someone had trodden a quiche into the carpet. Anyway! Back to 2011, back to Wet and Wild. Remember our snappy fat/wet suits from earlier in the holiday, purchased in Aquatica in a pique of self-consciousness? Well, we were soon back in those, our jiggly bits cocooned safely in bulging lycra, meaning that we looked to all the world rather like two extra large condoms stuffed with cottage cheese. No matter – as long as no-one laughed at me, I didn’t care. We were straight into the lazy river to ‘acclimatise’ to the water temperature. I got sassed by a lifeguard for not diving in, but to be fair, I practically had to smash my way through the ice-crust it was that bloody cold. The lazy river here leaves a lot to be desired, doesn’t it? Admittedly, it doesn’t have the ped-egg flooring that Disney prefers, but still, give us something to look at other than impossibly sculpted lifeguard bodies. Most of the day was spent doing slide after slide, and incurring injury after injury. The Storm – the natty slide that shoots you down a steep drop and deposits you like many a poo into what looks like a giant toilet bowl was awesome, as ever, even if I did have to sacrifice my Robin Williams back-hair, which was lightly flayed off under my lycra by the rivets on the slide. Brain Wash is as good as ever, and thankfully they’ve set up an automatic lift so you don’t have to carry those colossal rubber-rings up the winding staircase. Paul and I aren’t especially fit, and anything that reduces the need to break a sweat is good for us. Still, it’s a steep climb, and we’re clearly fitter than last time as we didn’t have to set up base-camp halfway up the tower. I love Brain Wash – try and take a second whilst you’re shooting up and down the tube to look up – they play a nifty ‘subliminal message’ video on the ceiling. All good fun. I banged my head – my own fault – on the side as I was too busy pulling a stupid face at Paul as we were flushed out. So that’s injury two. With a sore head and a flayed back, we took some time to people-watch, milkshake in hand, under the nice umbrellas by the wavepool. And good lord, we didn’t half see some sights. I know I’m a judgemental sod and hypocritical as I don’t like people taking the mick out of me, but I’ll make no apologies for biting my bottom lip and going ‘Ooooh, look at ‘er’ to Paul for a good half hour. Wet ‘n’ Wild seems to attract a more…hmm…Brighthouse crowd, if you see what I mean. For example, one of the sun-loungers was occupied by someone reading Inside Soap. Now who on Earth goes to the trouble of packing a magazine about English bloody soap operas as reading material on a holiday? Bet she orders Egg and Chips in every restaurant. Also – surprising amount of bad tattoos, especially on necks. I can’t abide it. Frankly, if you have to have the name of your child inked onto your lobster-red neck just so you don’t forget their name and birthday then you shouldn’t be bloody breeding in the first place. Still, it doesn’t beat the worst tattoo I’ve ever seen (some years back, in a rough pub in Newcastle) (Raffertys, if anyone is wondering) – the poor bloke had ‘ENGLUND FOREVER’ inked on his hand. See, if that had been me, I would have asked the tattooist to tattoo a wavy red line under ENGLUND and make out like I was being terribly hip and ironic. So yes, with my head better and my back crisping up nicely, we decided to do Mach 5. I’m not a huge fan of this ride, because I always manage to lose my dignity somehow – either I come off the mat halfway down or, right at the start, mis-time my bellyflop onto the mat so that I whizz down the slide on my belly whilst the mat cheerfully leads the way ahead of me, just out of reach. Paul’s a genius at stuff like this and never misses, so to humour him, I went on. I didn’t miss the mat. I didn’t come off the mat. Nope, I managed to stay on but, having jumped eagerly, managed to land almost squarely on my clackers, which became pretty much sandwiched between the mat and my lycra-clad body. So – the entire ride was spent having my fertility smacked out of me and I was a very, very interesting shade of puce at the end. Not good. Thank Christ I don’t have to worry about my sperm quality. Paul was sympathetic in that he only guffawed at my predicament rather than fell into hysteria. The tinker. Mind you – he didn’t seem too well either. Yep, turned out that his ear was playing up again. Ever the trooper, we spent another couple of hours barrelling down the slides and splashing in the water before retreating to the Room of Shame to get changed. We decided to head down to Walgreens to visit their instore doctor, all the while I was silently mouthing my words so Paul felt even more deaf. Mind you, clearly his ear wasn’t too bad – he decided that the sensible thing to do whilst suffering from a balance problem was to have a go on the Slingshot. Yes – that giant tower that you see at the top of International Drive, where those who have been dropped on their heads as children strap themselves into a ball and get slung 200ft into the air, stopped only by two elastic bands. Well, I’m sorry, I’ll do any rides, but I wasn’t going to do that. I don’t trust any ride that looks as though it’s been pieced together by whatever was left over at the Meccano factory. However, being a proper black widow, I ushered Paul onto the ride, and bravely took photos. I wish they had come out well, but it just looks like someone has smeared a blur onto the photo he was going that fast. Apparently, it was brilliant, ear problems or not. Having got that out of his system, we arrived at Walgreens with a minute to spare. Now, the doctor was fantastic. She performed all sorts of little tests on Paul, and after 40 minutes of clucking her tongue and checking her charts, she diagnosed that the poor bugger had a perforated ear-drum. Of course, I immediately start hyperventilating knowing that we were flying in a few days time, but she reassured us that he would be OK to fly as long as he took the drops she was about to prescribe. Then, she told us the price. $245 (nearabouts) – $180 of which was for one tiny dropper bottle of antibiotics. Luckily, I managed to floor her with the first punch and Paul ran out with the bottle. I wish. No, we paid up, and I almost perforated his other eardrum whinging about having to pay for something I seem to get routinely prescribed at home like Smarties. Seriously – I could go into my doctors with a missing face and he’d send me on my way with a crate of amoxicillin and a flea in my ear. Thank Christ for travel insurance. We made a tonne of calls later that evening and actually ended up getting nowhere, just one big circle of call centres and idiots who couldn’t tell us what to do. Worst yet – that ended up costing us about $400 in phone call charges from the Hard Rock! Bah. Next time he damages his ear, I’ll just fill it full of cotton wool and use sign language. Only really need to know ‘Feed Me’ ‘Have you douched?’ and ‘Go to sleep’ to get by. Before turning in for the night, we wandered down to Olive Garden for our evening meal. Absolutely delicious. I don’t remember an awful lot of it save for three facts. First – I was getting eyed up by a splinter-thin River-Island-clad pipe-cleaner of a man who followed me to the loo, only to turn around and leave in disgust when I went into a cubicle and deliberately trumpeted as loudly as possible. Second – the food was scrummy, and the cocktails even better. Third – we gave our server a $100 tip on a $60 meal, because she dealt with us with such aplomb whilst having to serve a table of twelve boorish Americans all waving their hands in the air. See – I’m flying the flag for Britain! All in all then, a mixed day. We love Wet and Wild – yeah it’s rough and it needs polishing up, and it has nowhere near the level of class that the likes of Aquatica or Typhoon Lagoon have, but if you want fast rides and easy living, it’s the one to go for. Plus – remember my tip for an early morning pick-me-up: free coffee at the Metropolitan Express. But stay there…not on my experience. It’s up to you what sides you serve this with to make up the third-speed-food-rule on your plate, but I’m not going to pretend that we didn’t just eat our quarter and immediately go back for more, with the roasted broccoli still in the oven…oops! I’ll say this – if you cook only one of our recipes, ever, cook this. It makes a pan full of absolute bloody wonder! TOP TIP: don’t chuck away the white part of the spring onions, put them root-first into a glass of water, and they’ll grow again! Easy.